Galanthus is a genus of flowering plants that includes 20 species. Flowers from the galanthus genus are typically referred to as snowdrops. These perennial plants grow from bulbs and feature beautiful flowers with no petals. Snowdrops are very hardy plants, and they grow well in a variety of climates and terrains. Dormant during the summer, these flowers bloom early and are, for many gardeners, the very first sign of spring's arrival. 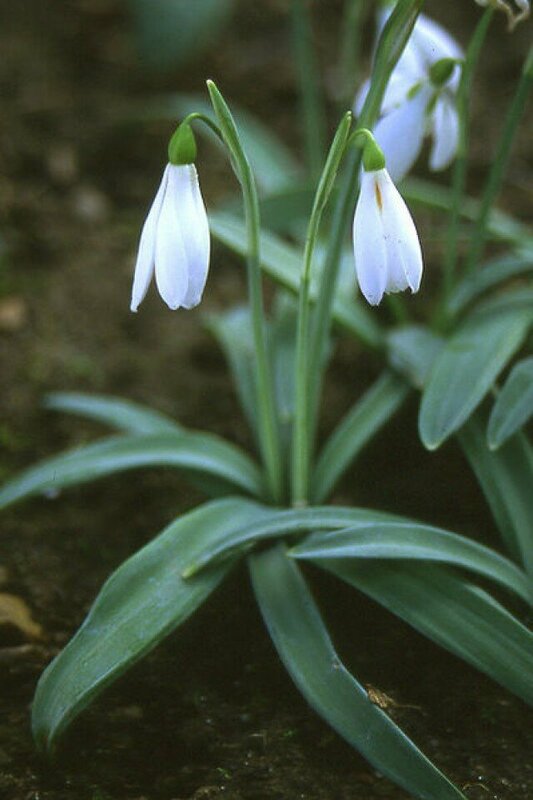 The most popular species include the common snowdrop (Galanthus nivalis), the Crimean snowdrop (Galanthus plicatus), and the Giant snowdrop (Galanthus elwesii). Snowdrops should be planted during early fall, in areas where the soil is typically moist. It is best to plant snowdrops in groups of 10-15 flowers. Before planting, loosen soil and work in your preferred variety of fertilizer. Plant the snowdrop bulbs in the soil with the base facing down and the pointed end facing up. Be sure to water snowdrops regularly. They require more moisture than most types of flowers. o­nce your snowdrops have bloomed, you should dig them up and separate before replanting. To divide clumps, split the original clump in half and return o­ne half to the original hole. Next, split the remaining half of the original clump into two new clumps. These clumps will be smaller, about o­ne fourth the size of the original clump. Snowdrops do not need to be pruned. Dead leaves and flowers work well as fertilizer for the bulb, so they should not be removed. It is not especially difficult to maintain snowdrops. With regular watering, these beautiful flowers are easy to care for them. The bloom of your snowdrop flowers will be sure to alert you to the coming of spring each year.